Just a little something I stumbled upon on my travels across the world of Wikipedia. 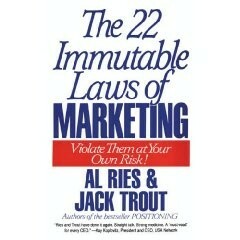 And appearently there is also a book of the same name "22 Immutable Laws Of Marketing" by Al Ries and Jack Trout.Which I discovered after the fact. To see a more descriptive version of the list go here. Ah the internet a wealth of information! 1. THE LAW OF LEADERSHIP. It is better to be first than it is to be better. 3. THE LAW OF THE MIND. It is better to be first in the mind than to be first in the marketplace. 8. THE LAW OF DUALITY. In the long run, every market becomes a two horse race. 9. THE LAW OF THE OPPOSITE. If you are shooting for second place, your strategy is determined by the leader. 12. THE LAW OF LINE EXTENSION. There is an irresistible pressure to extend the equity of the brand. 13. THE LAW OF SACRIFICE. You have to give up something to get something. 17. THE LAW OF UNPREDICTABILITY. Unless you write your competitor's plans, you can't predict the future. 22. THE LAW OF RESOURCES. Without adequate funding, an idea won't get off the ground.